Telomeres are sections of genetic material at the end of each chromosome whose primary function is to prevent chromosomal “fraying” when a cell replicates. As a cell ages, its telomeres become shorter. Eventually, the telomeres become too short to allow cell replication, the cell stops dividing, and ultimately dies--a normal biological process. SpectraCell’s Telomere test can determine the length of a patient’s telomeres in relation to the patient’s age. The Patient Telomere Score is calculated based on the patient’s telomere length on white blood cells (T-lymphocytes). 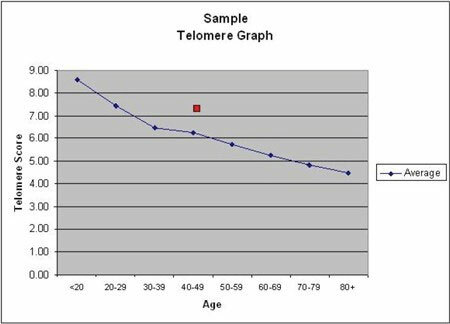 The graph below shows the average telomere length on lymphocytes from a sample of the American population varying in ages. The higher the telomere score, the “younger” the cells. A Telomere Score that is above the average line is desirable. Age-adjusted telomere length is the best method to assess biological age using structural analysis of chromosomal change in the telomere. Serial evaluation of telomere length is an indicator of how rapidly one ages relative to a normal population. Therapies directed at slowing the loss of telomere length may slow aging and age-related diseases. An inflammatory diet, or one that increases oxidative stress, will shorten telomeres faster. This type of diet includes refined carbohydrates, fast foods, processed foods, sodas, artificial sweeteners, trans fats, and saturated fats. A diet with a large amount and variety of antioxidants that improve oxidative defense and reduce oxidative stress will slow telomere shortening. Consumption of 10 servings of fresh and relatively uncooked fruits and vegetables, mixed fiber, monounsaturated fats, omega-3 fatty acids, cold water fish, and high quality vegetable proteins will help preserve telomere length. In addition, it is advised to reduce total daily caloric intake and implement an exercise program. Fasting for 12 hours each night at least 4 days per week is also recommended. One should achieve ideal body weight and body composition with low body fat (less than 22 % for women and less than 16 % for men). Decreasing visceral fat is very important. Getting regular aerobic and resistance exercise for at least one hour per day, sleeping for at least 8 hours per night, stress reduction, and discontinuation of all tobacco products are strongly recommended. Bioidentical hormone replacement therapy may also decrease the rate of telomere loss. Testing should be done once per year to evaluate the rate of aging, so that adjustments can be made in regard to nutrition, nutritional supplements, weight management, exercise, and other lifestyle modifications known to influence telomere length. 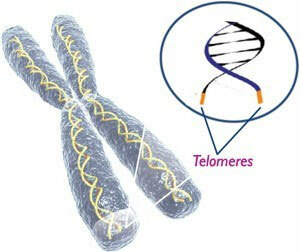 Oxidative stress will shorten telomere length and cause aging in cellular tissue. Antioxidant supplements can reduce oxidative stress very effectively (which will ultimately improve oxidative defenses and mitochondrial function) while also reducing inflammation and slowing vascular aging. Targeted supplementation is key, as antioxidants work synergistically and must be balanced to work most effectively and to avoid inducing a pro-oxidant effect. Increasing antioxidant capacity at the cellular level is critical to maintaining telomere length. Recent evidence also suggests that a high quality and balanced multivitamin will help maintain telomere length. Specifically, studies have linked longer telomeres with levels of vitamin E, vitamin C, vitamin D, omega-3 fatty acids, and the antioxidant resveratrol. In addition, homocysteine levels have been inversely associated with telomere length, suggesting that reducing homocysteine levels via folate and vitamin B supplementation may decrease the rate of telomere loss. Similarly, conditions such as cardiovascular disease, insulin resistance, diabetes, hypertension, atherosclerosis, and even dementia affect telomere length. Correcting subclinical nutritional deficiencies that may contribute to such diseases is crucial for telomere maintenance. Some clinicians have recommended reducing all known coronary risk factors, inflammation, oxidative stress, ADMA levels, and angiotensin II levels or its action. At the same time, therapy should increase nitric oxide levels and nitric oxide bioavailability, increase arginine, increase endothelial progenitor cells, improve mitochondrial function, and increase oxidative defenses. In addition, one should optimize hormone levels, exercise, sleep, nutrition, and nutritional supplements. Fasting and caloric restriction should be part of the regimen as well. These are all things that we can assist you with at the Balanced Body Center.